The day before I left a friend of mine told me that she hoped we would get lost and find ourselves. This evening we did just that. One of our party had received rather grave news about her father’s health. She decided that after some therapeutic shopping she just wanted to walk. 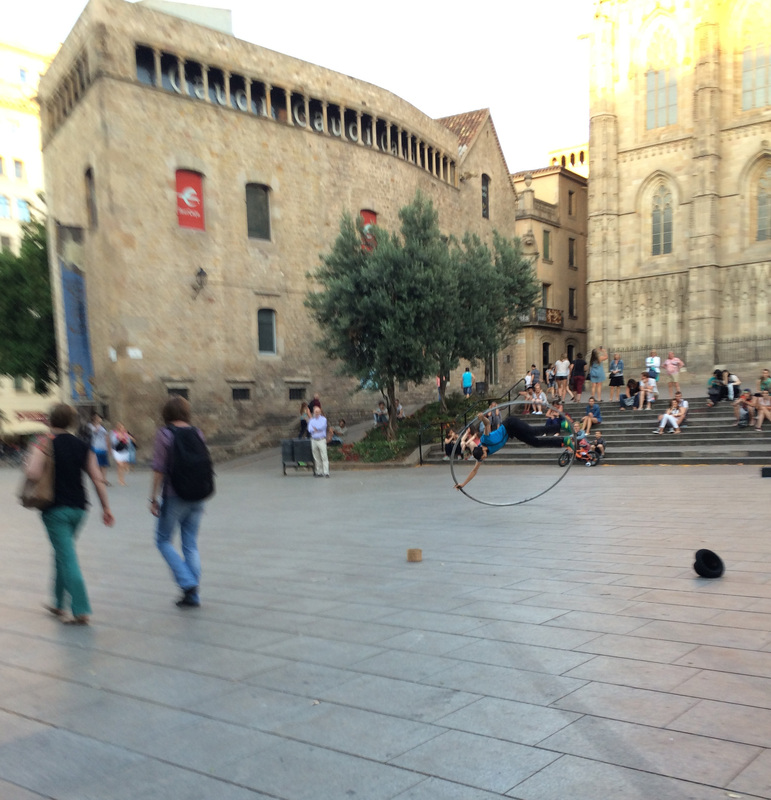 We were hoping to find Barcelona’s Gothic quarter. After walking to a street very much like Las Ramblas with lots of stores and merchandising happening on the street, we saw an alley veering off to the left. It looked, compared to other parts of the city pretty rough and ramshackle but we decided to try it anyway. Tho there were many people walking in both directions, the stores were closing down their graffiti covered doors. Continuing on our way we saw tall spires up ahead, somewhat reminiscent of La Sangria Familia, the somewhat awe-inspiring cathedral by Anthony Gaudi that we had visited earlier in the day. However where the Sangria was something magnificent, it felt like being inside a work of art, a triumph of masterful form over function. 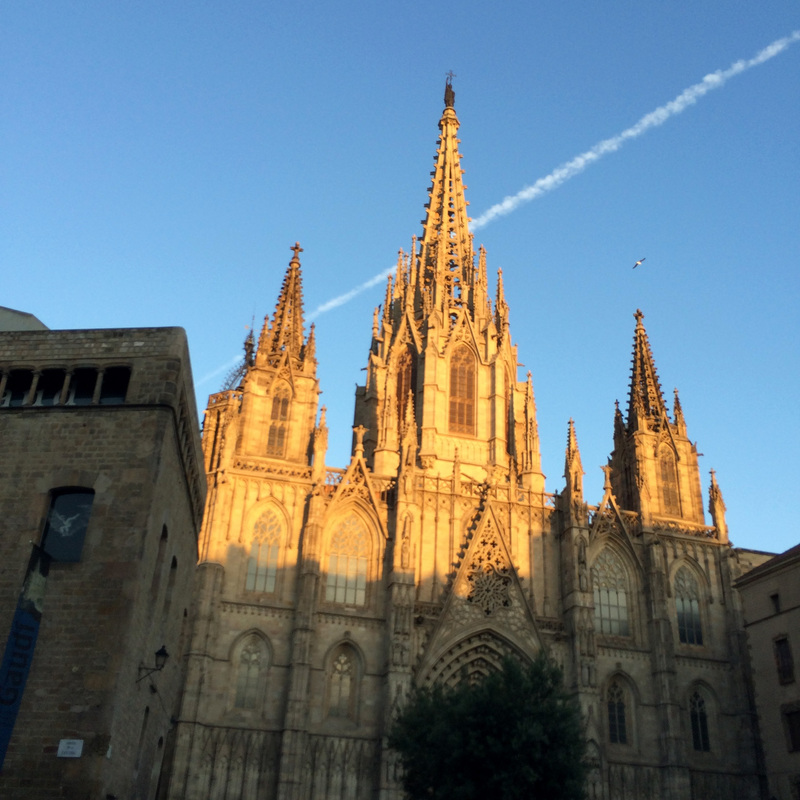 What we had stumbled onto was the Barcelona Cathedral in the oldest part of Barcelona, much more ramshackle and run down than the Sangria Familia yet breathed with a sense of spiritual presence I found missing from the former. There was statuary everywhere and people just being, enjoying the sanctuary of a comfortable place. There were artists doing their things and musicians and a couple of street performers doing amazing things with a giant hula hoop. There was a sense of history here. This place had been used as a church for hundreds of years and if it was not still in use, its sacred past has left footprints. We walked around the church through old cobblestone streets with statues of Saints and Gargoyles placed haphazardly almost randomly around the wall of the alleyway. Eventually we found ourselves at the far side of the cathedral. It stood in a small square area just off one of the main roads and occupied space there by youth hostel and a restaurant called Café Gloria. We sat down at this small café and had the best meal I have had yet in this city. This detour did much to centre us after a rather long, tho amazingly fun day. Sometimes when we get ourselves lost, we can find ourselves in ways we’ve never anticipated.